Steve Rice (Olympia, United States) on 21 November 2012 in Art & Design. 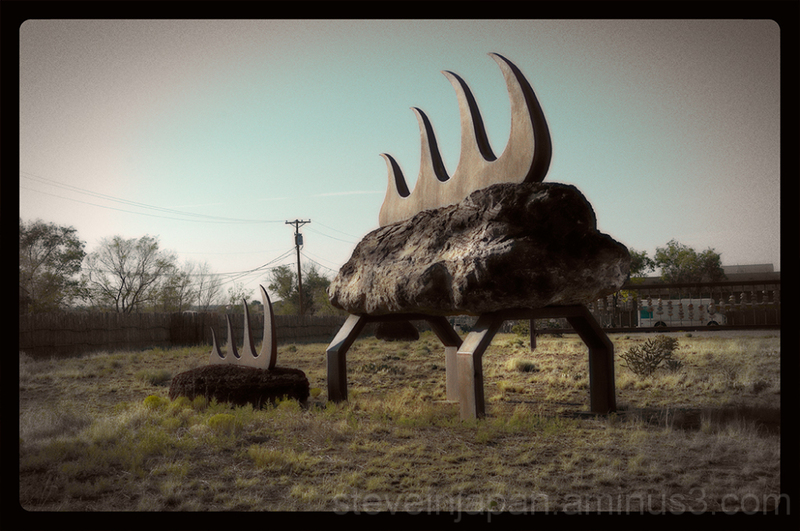 Sculptures by Paul Carroll seen in a vacant lot in Santa Fe, NM. Quelles formes ces lézard avec leur pic sur le dos, sueprbe iamge. Excellent, I like the framing and treatment. A nice open-air museum. This sculpture is interesting. Great shot. I rather like that this style of sculpture is emerging . .
Love the processing. I think I would clone out the telegraph pole and lines Steve. I like it all the same. Very imaginative, what a great idea! Very good idea !! Ah the artist !!!! any more imagination ! Lovely shot of a scary scene !! Egad ! I don't wish to be there alone after dusk !!! Sehr gut mit dieser Verarbeitung. Nice.. I like the framing.. Excellent processing to go along these sculptures. Such a unique find! Quite large lizards I might add. An impressive image for its size and how it looks in your frame. Nice job of shooting. That is so neat, very creative art piece ~ great photo! Watch out, they are as hard as stone... nice art idea. ANother creative sculpture. I like your perspective and treatment. Wow! Very interesting find Steve. astonishin contrast between the art craft and the quite abandonned place where it stays. Very interesting artistic work !